We are so excited to announce that Zero Gravity Therapy is Now Open! Our Zero Gravity Therapy floating rooms each have 10 inches of water and 1,000 pounds of dissolved Epsom Salts! An Epsom salt soak has been a time-tested plan to ease pain and relieve inflammation, making it beneficial in the treatment of chronic back pain, sore muscles, edema, bronchial asthma, migraine headaches, restless legs, diabetes, blood pressure, fibromyalgia and so much more. Epsom salt is magnesium sulfate. Magnesium is important to the enzyme activity in your body. More than half of all Americans have a magnesium deficiency, which is believed to be a factor in many health problems. Sulfate also plays an important role in your body. It contributes to the formation of brain tissue, joint proteins and the wall strength of the digestive tract. Epsom salt therapy helps restore magnesium and sulfate in your system because they can both be absorbed through your skin. Your skin will be glowing and feel silky soft after each session! The stress of the day is far away. Your mind is free to drift and tension easily melts away. 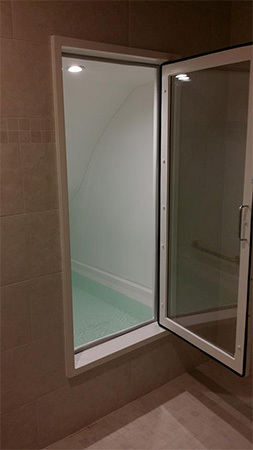 While in the float room, you will be completely relaxed, suspended in a dense water solution of pure Epsom salt. This creates the effect of near zero gravity. Your body floats like a cork on the surface of the water. Your entire body, including internal organs, muscles and bones will be, for the first time, completely rested and at ease. There is typically no light or sound during your float session. The air and water are maintained at skin temperature and the water is soft and silky to the touch. Free from the functions of interpreting and processing light, sound, temperature, gravitational forces, the brain is able to expand into areas ordinarily inaccessible except during deep meditation. Stress is left behind, healing takes place more rapidly, learning and creativity is enhanced. Feelings of profound peace are induced by the release of endorphins. After your float you’ll feel positively refreshed, rejuvenated and calm, a feeling that can last for days. Reduced sensory input (no light, sound or touch) combined with the feeling of weightlessness allows the mind to drift into a deeply peaceful state. People emerge from floating amazingly calm, grounded and happy. This state of being will linger for a week or longer. Flotation offers an environment in which to escape from stressful external stimuli. But if that were all it did, flotation would be essentially a passive experience, and entering the float room would be little different from sitting quietly in a dark room. Scientists have now proven that floating activates a physiological response of ‘Rest & Digest’. Through tests, including EMG (which measure muscle tension), EEG, blood pressure, and measurements of certain biochemicals, scientists have determined that floating can bring about a state of extraordinarily deep relaxation - probably deeper than is possible by any other means yet available. Stress causes harm by its disruption of our natural biochemistry. Cortisol has been proven to suppress the immune system. Tests have shown that floating significantly decreases cortisol. Flotation therapy has a number of medical benefits. In the gravity free floating environment the body balances and heals internally as all the senses are rested. Research shows flotation therapy measurably reduces blood pressure and heart rate while also lowering the levels of stress related chemicals in the body. Old injuries and stress related pain experience immediate relief as floating helps blood circulation and the re-absorption of stagnant fluid in inflamed areas. Float Therapy also speeds the muscle recovery time for athletes. Medical research has documented the decrease in chronic pain after floating! Pregnancy can be hard on your body as you try to adapt to hormonal changes and extra weight. Balancing your pregnancy with daily life; including your job and family, leaves little time to care for yourself. Soothe your back in water that gives you complete support and the feeling of weightlessness. The float room is a wonderful haven for pregnant women. If you have any concerns about the effects of floating on your pregnancy, we ask you to consult, and get permission from, your physician before you float. Pregnant women find they can totally relax in the float room, relieved from the burden of carrying the baby, due to the gravity-free environment. Many Americans are magnesium deficient. Doctors say it stems largely from the increasing prevalence of processed foods in our diets. Today, 68 percent of U.S. adults consume less than the recommended daily allowance (RDA) of magnesium, according to the Journal of the American College of Nutrition, and 19 percent consume less than half of the RDA. Epsom salt is made up of naturally occurring minerals magnesium and sulfate, which can help improve health in numerous ways. A lack of magnesium—which helps regulate the activity of more than 300 enzymes in the body—can contribute to high blood pressure, hyperactivity, heart problems and other health issues, doctors warn. Sulfate is essential for many biological processes, helping to release toxins and helping form proteins in joints and brain tissue. Researchers say that soaking in an Epsom salt bath is a safe, easy way to increase the body's levels of both magnesium and sulfate. Learn more about Floating and Epsom Salt by visiting our Zero Gravity Float page on Facebook. We maintain the highest standards of water quality in our float rooms. Each room is filled with 200 gallons of water and a 1000 pounds pharmaceutical grade Epsom salt dissolved into it. That concentration of salt alone would be an excellent sanitizer, but in addition to that, we use a powerful dose of ultraviolet light, ozone, a daily treatment of non-chlorine, all natural shock and a heavy duty filtering system. The entire sanitation system runs 24 hours a day. There are no chemicals used in our float rooms. Maintaining a chemical free environment, with sparkling clean water is our commitment to all of our clients. When you refer a friend, we'll send YOU a gift for $20 off your next appointment. Save up your gifts for a FREE Massage, Facial, Acupuncture or Zero Gravity Therapy session! The present philosophy of flotation therapy or restricted environmental stimulation therapy, (REST), is to offer people a unique way of regaining aspects of physical, emotional or psychological health. There are many schools of thought at the present time in medicine and psychotherapy that are oriented to teach people how to master their bodies and minds in order to achieve a state of deep relaxation. This is essential in the very highly pressurized society of the Western World. The need for deep relaxation has been validated by recent research showing that up to 90% of people who visit a General Practitioner do so because of a psychosomatic or stress related disorder. The advantage of flotation therapy is that it enables most individuals to experience very deep levels of relaxation immediately and without any special training. The patient does not need to learn any special technique to trigger the relaxation response. Other very useful methods like biofeedback, self-hypnosis, progressive muscular relaxation or meditation generally need a period of learning the specific technique, to be followed by a certain period of time and practice to reach deep levels of relaxation, especially when the patient practices on his own. Need to Change Your Zero Gravity Therapy Appointment? We greatly appreciate 48 hours notice when you need to change an appointment. Should you cancel your appointment with less than 24 hours notice, or if you miss the appointment, you will receive an invoice for 50% of the service.